The packaging of DNA in the nucleus is regulated by post-translational modifications of the histones that make up nucleosomes within chromatin. These modifications - also known as epigenetic modifications - make the sequences within DNA more or less able to be transcribed into RNA. The enzymes that carry out these modifications are known as epigenetic enzymes. Epigenetic enzymes are usually active as large, multi-component complexes, incorporating a diverse array of transcription factors, scaffolding proteins and canonical RNA binding proteins as well as the enzyme itself. Our work demonstrated that eRNAs bind to a regulatory region within the catalytic acetyltransferase domain of the key transcription co-activator CBP. By displacing this region from the active site of the enzyme, eRNAs could stimulate the acetyltransferase activity and promote histone acetylation and transcription. Different eRNA sequences produce different patterns of CBP-dependent histone acetylation. Our research focuses on one type of epigenetic enzyme called CBP. CBP is known as a transcriptional co-activator, meaning that the transcription factors that activate expression of gene also recruit CBP as a co-activator; recruited CBP to modifies the structure of chromatin to make the gene for accessible for transcription and thus promotes gene expression. CBP is a histone acetyltransferase (HAT), meaning that it modifies lysine amino acids within its substrates, such as histones, by acetylation. CBP also acts as a transcriptional network hub, by interacting with hundreds of different transcription factors. This means that it is almost always found bound to chromatin at enhancers. Our work has shown that the catalytic activity of CBP can be modulated in different ways by binding to different eRNAs. This leads to different patterns of CBP-dependent histone acetylation, e.g acetylation of lysine 27 on histone 3 (H3K27ac) or acetylation of lysine 5 on histone 4 (H4K5ac). 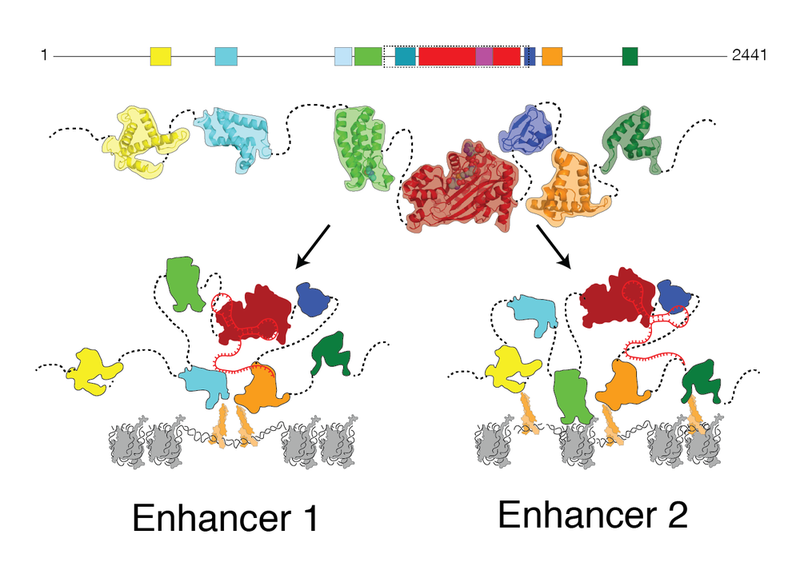 How does the organisation of CBP vary between enhancers? One question we want to answer with out work is how the structure of CBP varies at different enhancers. The sequence of DNA is different at all enhancers, meaning that the binding sites for transcription factors and the sequence of eRNAs are unique to each enhancer. We are interested in how CBP adopts different architectures to bind to these different unique enhancers. How do eRNAs contribute to enzyme organization at enhancers?